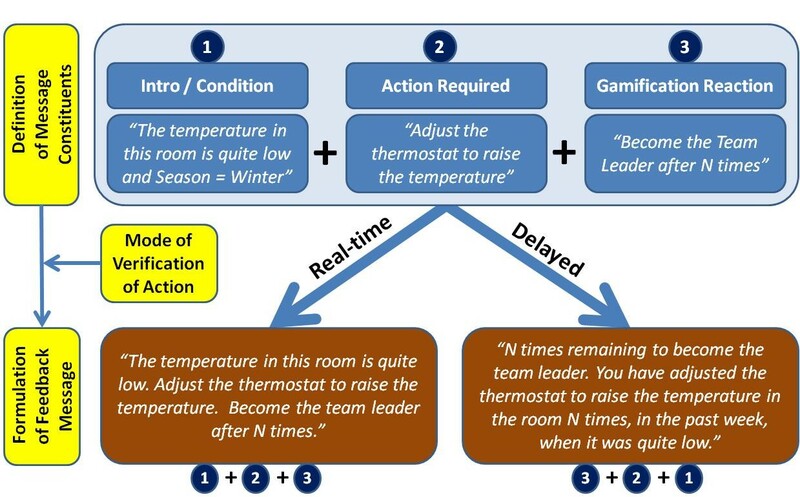 Gamification can be used to effect positive behavioral change in various fields, including energy conservation. This paper reports on a survey we conducted to formulate a holistic view of users’ profiles and preferences in an Internet of Things (IoT)-enabled gamified mobile application that provides personalized energy-saving recommendation tips to employees, towards conserving energy and adopting a more green behavior at the workplace. The collected insight dictates that a gamified app promoting energy saving at the workplace may become a daily habit for its users if it at least includes three game design elements: progression, levels and points. Additionally, we complement existing design guidelines about the requirements of each HEXAD gamification user type (Philanthropist, Socializer, Free Spirit, Achiever, Disruptor, Player) in game elements, specifically for energy efficiency applications. Thus, we apply and validate the HEXAD gamification user typology in a new context – multicultural workplaces – as well as domain – energy-saving. Moreover, the collected insight inspired us to devise a modular, rule-based mechanism for formulating personalized energy-saving recommendation tips tailored to the users’ profiles and game design choices. This research may assist researchers, as well as practitioners, in designing personalized gamified behavioral interventions, especially towards energy conservation in workplaces.